Getting down and dirty. The B word. It’s easy to say you’re paying down your debt. How do you even start? First of all if I were starting from scratch I would recommend reading The Total Money Makeover. Trust me people, its good stuff. Dave lays it out for you in a way that is simple and understandable. I will link the book below. He also offers a class called Financial Peace University that is offered at local churches. You can purchase it online to do at home or go to a class where you can learn and fellowship. These links will always be available in the tools section of my blog, because I truly believe in these products (and I am not getting paid to say that). We started by getting on a budget. Now I know what your thinking. Budgets are for poor people (or that’s what my husband thought). I have to say, I wasn’t really comfortable with the B word myself. But the truth is, budgets aren’t scary at all. They give you control, even in a seemingly hopeless situation. Budgets are the key to financial success. Knowing exactly where your money is going is your key to getting ahead. I remember at one point looking at my account and thinking, crap, where did all that money go? Now I know, because I told it to go there in my budget! 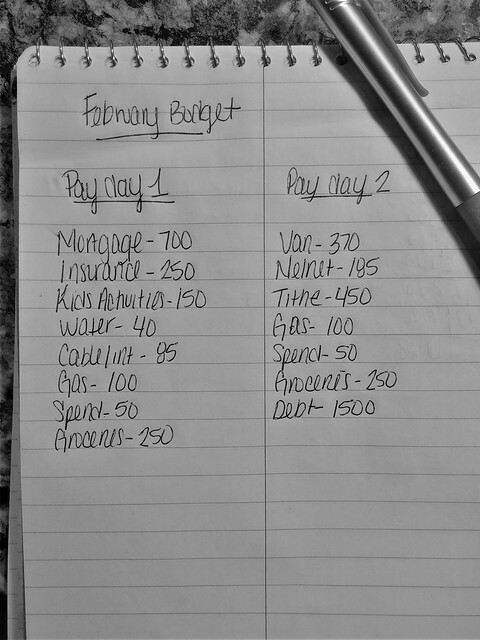 Creating a budget is way easier than you think. I just sit down before we get paid and plan the month out. I have two sections, because we get paid bi-weekly. But you may have one or even four, depending on your pay frequency. I start with how much our checks will be at the top and then I just start listing things I need to pay out of that check. Easy right? There is also the option of budgeting online. There are many great free budgeting apps, but I use Every Dollar. Even though I use the app, I still like to write it out pen and paper style. It just feels good (I know I’m weird)! Once you set up a budget you can see how much “extra money” is left over and give it a job. This is also called a “zero balanced budget”. That means you are telling every single dollar where to go. Instead of it sitting in your account, where it will probably get spent, it can help you achieve your dreams of being debt free. Now listen, sometimes you might sit down and realize you have more going out than what’s coming in. In this situation, take care of your basic needs first and then prioritize from there. Budgeting will still help you! You’ve got this! Do you have stuff laying around you don’t need? Sell it! Could you get a side job or pick up extra shifts? It is totally possible for you to do this! At this point you will be paying minimum payments on everything except your lowest debt. So say I have 400 dollars left, after all the bills are paid. I apply this money to my lowest debt. Once that debt is paid your snowball will grow! You will now have 400 + your minimum payment that would have went to that debt. It is an awesome feeling when your snowball starts to grow! You do have the option of listing your debts by interest rate. Dave doesn’t teach you to because the motivation of paying off your smallest debt first seems to keep you going. And the interest you save in a year or two is usually not significant in comparison. Well you there you have it. Now what are you waiting for? Write that budget! I just bought this book and workbook. Starting tomorrow (the day before our birthday.) I’ll be 36 and James will be 35 but hey at least we’re getting started. I have read the books, been to the classes and done the workbook so I’ve been committed to the program before – in fact I paid down about $65k in debt, got my credit score from about 350 to 740, and was able to get a loan for a house. But I’ve gotten WAY off track lately! I’m so glad ur doing this cuz I feel like I can do it WITH y’all! I’m in! 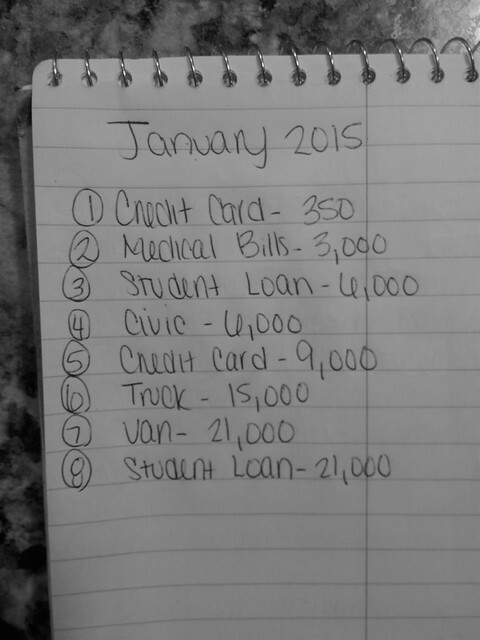 Going to do my budget over for February as a zero balance budget! I’d really love to pay off my house asap… I’m excited!